This entry was posted in Vacuum Tubes and tagged 12ax7/ECC83, 5751, Tung-Sol by tubemaze. Bookmark the permalink. I wanted to write about this tube for a very long time, so here we go. If you ever wondered what the term “liquid” means in context of tube amps and tubes, just get the tube and no explanation will be necessary. You will just get it. This tube is superb. Not very well known, but highly regarded. 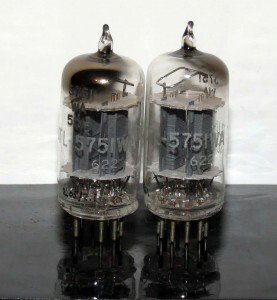 If you look at the landscape of 12ax7/5751 tubes, this one will stand out buy it’s unique sound and unique looks. It looks like an average 12ax7, except for a thicker mica, but the sound is quite different compared to even 12ax7 Tung-Sol. As with all 5751, the sound is very detailed and very focused and controlled. All is there without exaggeration, but at the same time the tube is not very neutral, which is great!!! It has character, it has balls, it has liquidity. When one note merges into another it’s not like solid state of binary, there is note and then there is none. With Tung-Sol, one note is liquidly changes into another, like water from one glass into another. This becomes highly desirable with vocals. Female vocals are just incredible. Not very rare right now, so get it, get it, get it! HIGHLY RECOMMENDED.